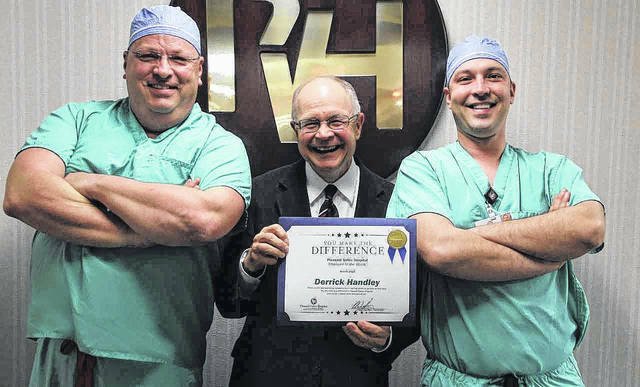 Pictured are Ryan Henry, chief of anesthesia and director of surgical services, Glen Washington, FACHE, PVH CEO, and Derrick Handley, PVH employee of the month. POINT PLEASANT — Pleasant Valley Hospital (PVH) announces the Customer Service Employee of the Month for March is Derrick Handley. Handley has been employed since January 2016. He is currently working as an Operating Room Technician. According to a statement from PVH, the employee of the month is nominated for taking extra steps to provide excellent customer service to our patients and family members at PVH. Handley was nominated by a PVH Auxiliary member who was working alone one day. A patient needed a wheelchair transport. The auxiliary member had three patients needing help all at once. Handley was walking by the transport desk while on break. He saw that help was needed. He took a wheelchair outside and assisted a patient into the chair from a truck, helped with her oxygen tank and assisted her into the building and to her destination. Later in the day, the auxiliary member was helping the patient back into her vehicle. She commented that Handley was “really nice, helpful and friendly.” She even said if she had a business, he would be on her list to hire. In this recognition, he received a $100 check and a VIP parking space. She will also be eligible for the Customer Service Employee of the Year award with a chance for $500.